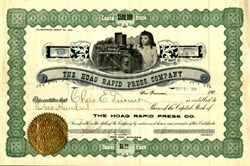 Beautiful certificate from the Hoag Rapid Press Company issued in 1904. This historic document has an ornate border around it with a photo vignette of a young girl operating the company's printing press. This item has the signatures of the Company's officers.